Nokia has lunched its first ymbian Anna OS based handset with a 1GHz processor named as Nokia 500. Nokia 500 is not a high end model, but with 1 Ghz processor we can do multi tasking without any loss in processing. Nokia 500 has a 3.2 inch capacitive touchscreen display with screen resolution of 640 x 360 pixels. Also have a 5 mega pixel rear camera which will be good for high clarity image capture. 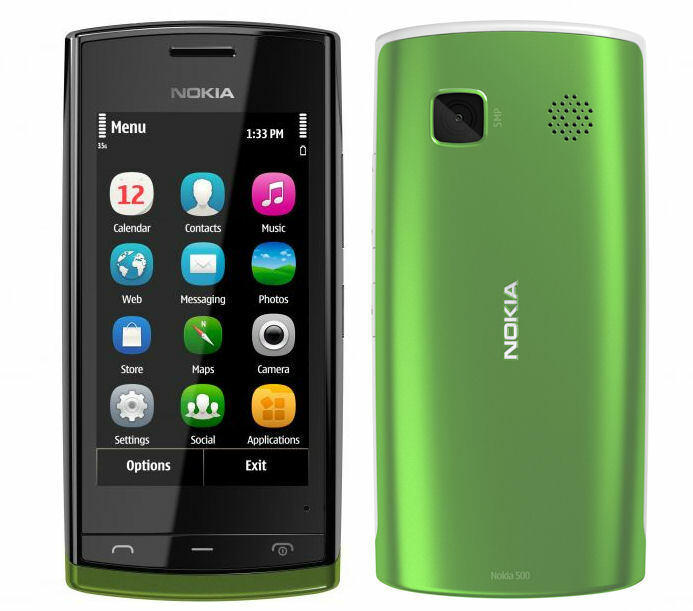 Nokia 500 comes with Nokia Maps pre-loaded with free walk-&-drive navigation. It comes with a 2 GB internal storage memory which can be expanded up to 32 GB using a microSD card slot. The handset will be available in black and white color, with user replaceable back covers of different colors. Nokia 500 is priced is about $ 150 and will be launched worldwide shortly. If you’re a Facebook user and want to keep up on the latest Technology news why don’t you join the CyberVally Facebook page?